Scientifically speaking HFO-1234yf is 2,3,3,3-Tetrafluoropropene. But we’re not scientists here at Highline, we are mechanics. So let’s talk about what R1234yf is to the rest of us. If you’ve been around the car industry for any length of time here in Mesa AZ, you may remember 1994 when refrigerant R12 ceased production and R134a became the standard automotive refrigerant. Scientists had found that R12 depleted our ozone layer and was bad for the environment. R134a was significantly safer, and has a GWP (Global Warming Potential) of 1,430, compared to R12’s GWP of 10,900. While refrigerant R134a was significantly safer than it’s predecessor, it still has a considerable global warming potential of 1430. In 2006 The European Union implemented directive 2006/40/EC that required all newly manufactured automotive AC systems to have a GWP below 150 by 2011. It turns out that HFO-1234yf has a GWP of less than 1 and fit the bill. As far as commercially produced refrigerants go, this is likely THE safest for our atmosphere that will ever be developed. HFO-1234yf does have one nasty little character trait though – It is mildly flammable. Automotive refrigerants are constantly exposed to high temperatures, and car AC systems can spring a leak in many common circumstances. A front end collision will likely puncture your car’s AC condenser which will release refrigerant. A failed AC component can do the same. Road debris may also create system leaks. All of these scenarios make scientists nervous – All it takes is a heat source to cause a fire and furthermore, create very toxic by-products. This being said the European Union performed real world tests, as did several other manufacturers (Mercedes and Chrysler), along with Germany’s Federal Motor Transport Authority. Results varied between tests, but generally speaking it was found that HFO-1234yf will not ignite without a heat source greater than 1650 degrees Fahrenheit. This is significant because at 1650 degrees every single fluid in your vehicle would be on fire as well, in which case it would not really matter if your refrigerant was flammable or not. This being said, auto manufacturers have unanimously agreed HFO-1234yf is safe for use in automotive AC. Which Vehicle Manufacturers use HFO-1234yf Refrigerant? If you are living in the European Union, any vehicle that was made in 2011 or newer contains HFO-1234yf. But what about back here in Mesa AZ, and the US? General Motors started using this refrigerant in 2013 in certain Chevrolet, Buick, Cadillac, and GMC models – All models will be converted by 2018. Chrysler, Honda, and Subaru began switching over in 2017. One key difference with the switch over of HFO-1234yf vs the previous switch to r134a is that there is currently NO deadline for manufacturers to make the switch. While we have no factual data, we at Highline Car Care believe most vehicles will contain HFO-1234yf by 2025. How Do I Refill, Service, or Add this new refrigerant HFO-1234yf to my car or truck? That being said, we recommend you visit a 609 MACS certified AC shop whenever having your air conditioning serviced or repaired. 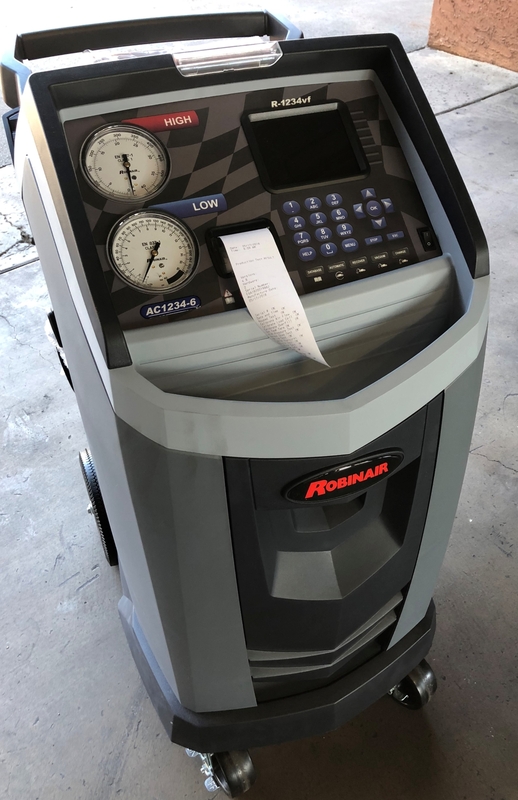 HFO-1234yf machines are specific to this refrigerant and you cannot use a r134a machine to service your new style system. 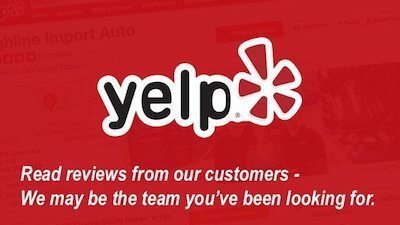 At Highline Car Care in Mesa, AZ we have done our homework. We invested in a dedicated HFO-1234yf machine even though 95% of the shops in the Valley do not own one. We pride ourselves in being leaders in our industry. HFO-1234yf service is very similar to the old system. Refrigerant must first be evacuated, the system will be pulled into a vacuum to remove any air or moisture, and the proper amount of refrigerant will be added to the system. Remember, a discrepancy of +/- .5 ounces can cause system malfunction or failure. Is HFO-1234yf AC service expensive? Short answer – You bet! This new refrigerant is currently over $150 per pound – Most new vehicles take 1-1.5 pounds. Previous r134a refrigerant averages about $20 per pound. We expect the cost to head downwards once availability grows, but in the meantime expect to pay a bit over double what your old system costed to service. Need a FREE AC quick check? 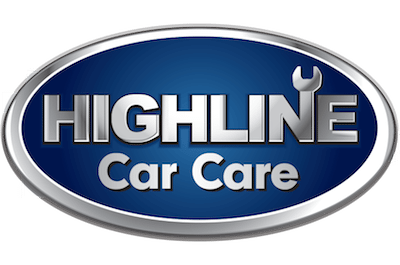 Let the Pros at Highline perform a 5 point AC quick check to pinpoint any issues with your car's air conditioning. When would you like to drop your car off?